Who says a girl can't wear a dress and wield a sword? It has become fashionable now for princesses to run away and seek adventure. Princess Arianna of Linderall, however, is willing to stay home and be proper. She screams when she sees spiders, enjoys sewing and dancing, and always looks at her reflection first thing in the morning. 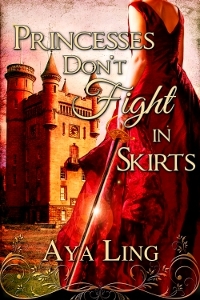 What happens when her great aunt, the first woman warrior in history, decides that Ari is too "traditional" and sends her off to the Royal Rivieran Academy of Fighting Arts? Can she survive the vigorous physical training and earn the respect of her peers? Moreover, can she attract the attention of a prince even when she’s forced to relinquish makeup and dresses during training?